Congratulations to our member of the month, Mike Frustaci!!! 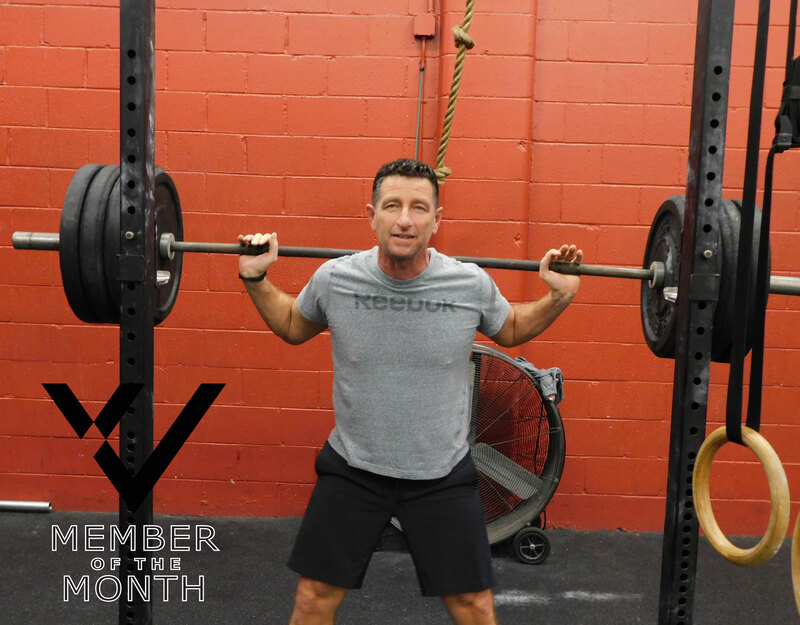 Mike is quite literally the longest running member here at CrossFit Vae Victis, and is an inspiration to us on a weekly basis. He shows up a handful of times each week and just works, regardless of what we’re doing that day. Although he is smart with his training, he is always pushing the limits of his capabilities, often using RX weights, knowing that it will take him some time. Regardless, he always finishes and has the gyms full support cheering him on. He manages a busy work and family schedule, often traveling for short periods of time but continues to get his training in here at home or on the road. When home and in the box, he is always a good time to be around, having fun and telling stories with his fellow training partners. We love his enthusiasm and the relationships he has with everyone in the gym and thank him for his always positive attitude and making the gym a better place! Below are a few fun facts about Mike that you may not know. In August of 2012 I turned 50 and weighed about 225. At the time, my wife had just started at Crossfit in Massachusetts and I decided it was time for me to check it out when we moved to NJ that same month. I was hooked on the WOD concept almost immediately. I was alsoy sold on the true Crossfit mindset when a couple of members, who had finished the WOD long before me, cheered me on and joined me to finish a 400 meter run. Within 8 months, I was down to a too skinny 173 pounds, and after continuous training am now 195 and feeling the best I have ever felt. Suffice to say, that it was easily one of the smartest decisions I ever made (out of 3 total). I guess the easy answers would be how the workouts vary and how they can all be scaled, or how the programming is all set so that I don’t have to think about it every day. Truthfully about a third of the time I begrudgingly drive my body to the box without any real desire to work out, but I find that as I walk in that desire renews in me somehow. My favorite thing however has to be a combination of the ability to accurately and soberly measure my progress over time, and the understated though spirited and friendly, helpful, competitive nature among Crossfitters. Great Pad Thai is hard to find, so I have to go with buttered/salted movie theater popcorn with a big bag of peanut M&Ms mixed in. At the age of 39, on September 11, 2001, about 8 hours after the towers fell, I had a heart attack and underwent stent placement one day later. If someone had told me or my cardiologist that I would be Crossfitting like this at the age of 54, neither of us would have believed it. We should all defy the odds in some fashion at least once during our lifetime; it’s a very grounding yet liberating aspect of the authentic human experience. Once again, congratulations go out to Mike for impressing all of us with his amazing personality and “never say die” attitude. That is what it means to be the CrossFit Vae Victis Member of the Month. Check back next month for the next Member of the Month. We will once again be highlighting one of our great members that is killing it in the box.